For prospectors, referrals are important. When you’re a business developer, it’s helpful if you can engage clients to the point that they’re willing to refer another business to you. Today’s guest is Brandon Bruce, the COO and Co-founder of Cirrus Insight. In today’s episode, Bruce will be talking about the top of the funnel. Listen to the episode to hear what Brandon has to say about referrals and about the tips, techniques, and strategies that he’s using in his own company that may also be useful for you. Marylou: Hi everybody, it’s Marylou Tyler. This week’s guest is Brandon Bruce. What I love about him is first of all he’s really tall, he’ll tell you about that. The second thing is that he is gonna talk to us about some interesting techniques, strategies, tactics that he’s using in his company. He’s like feet on the street, fighting the war, in the zone, and he’s gonna give us some tips on top of funnel. What’s really cool is that he briefly described before we got on live referral with prospects. I would love him to talk about that because referrals are important for us, as well all know, but it’s usually tied to clients. If we’re business developers, then we love them and lead them before they’re even a client as we pass that lead off. He’s gonna share with us some insights on how to engage them to the point where they’ll refer a business to us. Without further ado, welcome to the podcast. Brandon: Thanks a bunch, Marylou. Glad to be with you. Marylou: Let’s get the height thing talked about. How tall are you? Brandon: I’m about 6’8, or sometimes I will say I’m 5’20. Speaking of the top of the funnel, it’s one of those funny things if I show up at a tradeshow or a conference, I will literally stand out. Sometimes people ask do you play basketball or do you like playing tall or watch your head or how’s the weather up there, or whatever. To be honest with you, I enjoy it. It’s a good icebreaker, it’s a conversation starter. If I walk into an elevator, someone is gonna say something because I’m gonna be usually taller than everybody. It’s a way to just smile, laugh, we’re all made differently, have a little conversation about it. We’ve had a lot of fun conversations on tradeshow of course about that. Tradeshows, conferences, anything in person is all about making friends and then later, “What do you do? Cool, I’ll try it. That’s awesome.” They rarely work if you pitch with business first, try to solve a person first and then business second. Marylou: What we like to about is grabbing people’s attention and getting that emotional connection in a very quick moment of time, if you can. Only when it makes sense to face over into the logic of specificity around, here’s the opportunity, but upfront it’s about trying to get some way for people to open their eyes or lean in or jolt them out of their stupor and recognize you and notice. That’s all good. Tell us about your company and tell us about some of these great tips. Let’s start with the company, what do you do? Brandon: Our company is called Cirrus Insight. Like you said before we started the show, we can joke because sometimes people will call us Serious Insight. Last year, I got introduced one coming Citrus Insight which we liked because then we did an April Fool’s joke that we were an orange juice company. Most recently someone said Circus Insight which I thought sounded the coolest company. Maybe we can do the analytics for circus companies. It’s Cirrus like the cloud, we make cloud software for sales teams. We were the first application six year ago when we launched that connected Gmail with Salesforce. For our users who are primarily sales people, it’s a big time saving tool rather than jumping back and forth between the Inbox and Salesforce. We bring Salesforce in the Inbox so you work from one place which is where you’re having customer conversations and then our application makes it easy to get all of those activities, all that sales tracking into your CRM platform. We also have all the productivity tools that help people save a lot of time in sales, a meeting scheduler, email templates, email open tracking, the ability to schedule out cadences at emails over time and some scripts and so forth. It’s really a suite of power tools for salespeople. Marylou: You’re obviously deep in the weeds in prospecting. Why don’t you share with us some of the main things that you’ve been discovering, couple things that you’ve been describing over the last year, and what doesn’t work so we can get that on the tables as well, from your experience. It sounds transactional, maybe not super complex sale but there could be a lot of working parts to it. Brandon: For us, some of the things that worked really well in the past work less well now and some of the things that didn’t work at all we’re finding are starting to work. An example of the first one, I think that five years ago or even, it was a race to whoever had the biggest mailing list would win, whoever had more email addresses was gonna win because it was a race to get access to the attention span of the recipients and we could find them in the inbox. Now though, everyone is emailing everybody all the time. It’s less about how big the list is, the size will still matter but it’s more about do anticipate your communications? Are they fun? Are they engaging? Do people mind receiving them? Are they interesting? The bar has been raised as far as what does it take to get the attention of those recipients and get them involved in the top of your funnel by email. Meanwhile, when we were a small company, we also thought, “What we need is this viral engine, we need people sharing about our application with others.” We tried that a couple times, neither time did it catch at all. We invested a lot of time and energy and some money, some resources and the how do we build these referral networks. We decided, at least at the time, that two things weren’t working well. One is, we’re business to business. We thought, “Maybe all of these companies that we’re seeing have all the success are more B to C.” They’re appealing to these huge demographics. Tens of millions of people could potentially use the software whereas our target market was substantially smaller. We thought that may be our problem. Two, we thought maybe we don’t have enough customers yet, maybe we’re not feeding the idea to enough people that can then share it so the map was in our […].” Who knows, or we just didn’t do it properly. We’ve also invited prospects to do the same thing. If you’re a prospect and you come to cirrusinsight.com or go to cirrusinsight.com/referral, you can get your referral code. For those that are mathematically inclined, you can take that code and pop it in your web browser and start the trial. You’ve started the trial so you get one, and you get another one because you referred yourself, you can actually start off with the $10 gift card and then you can then share that code with everybody. If you’re a person that’s popular in your company or you do a lot of networking and you got friends a lot from other companies, being able to share that code internally and externally is a way to get a lot of folks on board pretty quickly. If you wanna share your code to 100 people that start free, no obligation trial at Cirrus Insight, then we’ll give you 100 times $5 gift codes, we’ll send you a code for $500 for Amazon which is great. It’s almost the same as cash, you can buy pretty much anything on Amazon. That is starting the catch and we’re excited to see it, we’re getting the word out. Every channel that we can think of, it become a big focus area for us to spread the news via social media, we’re obviously sending out codes via email, it’s on our website, a small banner at the top, we included it in the footer of our marketing emails, we’re adding it to our signature blocks when were emailing out people directly through Gmail. It’s something that we’re trying to put some energy into to find out if it’s gonna work on us, to find out if they can get that critical mass and start the flywheel that is “viral marketing” so that enough people start telling enough people, it can get some energy of its own and we’ll start seeing the exponential growth in trial starts. From there, obviously, it’s our job. That’s spending a bunch of money upfront to get trial starts and then it becomes the job of our team to marketing and sales and excellent customer service and support to make sure that we translate those trial starts, convert them at a pretty good clip into paying customers. Marylou: Most of the time, when we talk about referrals, we do focus on the client base. They often brought up the question, “What if I am a startup? I don’t have any clients yet that I can ask for referrals.” When do you place that ask? When is the best time to place the ask for referral? Is it as you’re going through the sales process? Say we got them to an opportunity as a prospect, they’ve engaged with us, they’re bringing people from their company. We’re getting to know each other better, we scoped out what their needs were, what the initiatives are and we fit into that. I’m gonna be asking you, once you become a customer and you’re happy about referrals. You preempt letting them know that somewhere down the line, we’re gonna have a discussion around referrals. That’s was the one way that I was taught way back the dark ages of selling. Brandon: It’s still great advice, it still works. It’s absolutely something they should all keep doing. Marylou: The other thing is when I work with clients, I have them draw a box, essentially a four quadrant box, to tell me how they wanna do their business development. If their business development is with existing clients selling new products or existing clients that are trying to create a more synergistic usage of the product so they add in features at the product that are paid for features so they grow the average deal size of a client. That whole quadrant where it’s client related is a place that I think a referral engine works really well. But I was stomped on the new side of how to get people in because we’re using relationships and we’re using rapport and trust in our relationship referral machine with the client. I wasn’t sure how to do that when you are working with prospects. You mentioned incentives, are there other things that you’ve tried from the prospect perspective to get them to refer without incenting them with money or gifts or things like that? Brandon: I think certainly having something out there, the price when you’re product, etc. to see what makes the most cents. We’ve seen gifts range the gamut from a very small to the $5 gift code. We’re using all the way up to big ticket items, we’ve had stuff arrive to the office when we started piloting something that we’re gonna use and it’s like, “Wow, someone sent us an air hockey table.” That’s pretty cool. The office rallies around it. Of course the big question is who did this? Who got it and why did it arrived it? Someone raises their hand like, “I’m trying out this platform we might use for whatever.” I guess they sent it to us and everyone goes, “I don’t know who that company is but I like them.” Sounds like a good group to do business with. Those are great community based viral networks because I haven’t sent a message saying, “Dear recipient, you oughta try Dropbox. It’s so cool.” Instead, I’m sending you something and to get access to it, you have to try it. Those ones, I think, are brilliant if it aligns with your business model to be able to get those out. But of course, a lot of those companies have also used, at least from time to time various incentives for them. For the Dropbox, Evernote, etc. of the world, often times, it’s a certain amount of time for free or additional capacity, more storage, get another gig if you sign up now or try now for free, etc., or add a friend and you can have another gig. You can have gigs and gigs without paying by getting more people to try the service. I think those are smart. The company is not out of pocket, their referrer gets something they want, more storage, and the recipient […] either so everyone can be pretty happy about it. Marylou: That’s adding existing perks to the product that doesn’t cost you a lot because they’re already developed but it adds goodwill because you’re giving them more storage or you’re giving them another feature that you’re turning on for them, things like that. Brandon: The one that quickly popped into my mind when you use the word incentive is like there’s the paid incentive and there’s the extra or additional product built in which is pretty easy to give away. I think there are company and you see lots of them out there, Salesforce does this, Microsoft does this. The value of badges, just recognition to people. Early adopters, folks that are evangelists for Salesforce or Microsoft or Google and they’ll say, “You’re an MVP. You can put this badge on your LinkedIn or in your email signature and then maybe once a year we’re gonna invite you to a special conference, you get a special seat or you get to meet this executive, or have an online chat panel. Tesla does this too, they have referral codes. If you give away enough, then you get invitations to specials events they might have. We’re gonna unveil our […] in the desert and you get to be there for it. Those types of things are, in some ways, very experiencial. There’s a value to it, you’re invited to a conference, there would normally be a ticket but it’s also special. You couldn’t buy a ticket to have the special audience with that exact, you earned it by being an influencer. Marylou: The scarcity, there’s so many people that this happens for because you’re being recognized as a loyal contributor to the company and the goodwill of the company. There’s some special perks for you. I love that. Brandon: Which is pretty great. If all of us can build brands that have that kind of affinity where people just wanna be close to it and wanna get even closer, they’re willing to spread the word so that they can have a mere status or get the badge or get additional points, then that’s a pretty great situation. 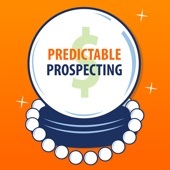 Marylou: I did this when we launched the second book, Predictable Prospecting. I had a bank of what I call loyal fans who are just […] to do whatever I ask, within reason of course. In this case, I was saying, “I’ll give you advanced copy of the book, you’ll get an actual hard copy of the book, signed by me, sent to you via snail mail.” There is some payment to do that. I asked for a review in return once you read the book, your real, honest opinion about the book. I had a bunch of people who were willing, wanting to do that. It’s so great to have them rally behind you when something like this is getting launched. I’m getting ready to do a third book now. I’m seeing who my army is and trying to get them all corralled and figured out as to how we wanna go about doing this next launch. It’s the same concept. That’s how you get to learn from the process if you ever wanna write a book, then you can follow my playbook that we’ve implemented and you will be a part of it It’s the same sort of thing that works so well in political campaigns, they’re recruiting folks who wanna help. But they buy in, there’s a belief in the vision of what the candidate is trying to accomplish. Marylou: I actually call them my influencers, they’re my influencer network. They even drive, to some extent, the table of contents of the book, what they like to see. Right now I’ve got them in a class that I’m doing. I get plenty of feedback, what they like, what they don’t like and it’s all open, wonderful dialogue back and forth. These guys are taking my body at work and activating it, deploying it, optimizing it. That’s at scale because I’m just a one person, I can only do so many accounts, multiply that by my fan base all doing it and we get some great feedbacks of what works and what doesn’t and how to improve. I love it. It’s the best thing. We’re like, “We had this other idea but we’re gonna scrap that one, put it down on the totem pole, we’re gonna elevate the customers’ idea because everyone is going crazy for it.” To the extent that we’ve had success, it’s because we’ve listened to those ideas and then worked our tails off to implement it as fast as possible and get it to the market before anyone else can because we feel like if the customer shared it with us, that may be the first time someone shared that idea. If we can get it out to the market fast, it’s a big competitive advantage for our customers. Marylou: I want to be respectful of time, we’re hitting close to the top of the hour here. I heard you say something and I want you to drill down a bit for us on it, this whole concept of it used to be that the person with the biggest list blasting out emails wins. You said that landscape has changed, walk me through because I am a big proponent of blending personalization, what I call Hyper Personalization, and then leveraging the data to personalized email messages. It’s the why you’re sleeping engine but smarter. I’d like to hear your thoughts on if I were to take my segment of accounts, do I create tiers and those tiers basically are built based on how much personalization, customized personalization, hyper personalization, whatever you wanna call it, that I wanna do to that group, those dreams clients versus everybody else or do you blanket personalize now every communication coming out of your shop? Brandon: We definitely don’t ultra personalize everything because we have a list of several hundred thousand folks. Some of them we know really well and they know us really well and some that are brand new to us, we just met them last week at an event, let’s say. We don’t know each other that well yet so we’re gonna send them things from Cirrus Insight, the company and the brand. Our sales team will reach out directly one on one and try to send those more personalized, “We’ve done a little research, we see what your company does, what you’re about, maybe where you’re trying to go, maybe we worked in your industry before or with companies that are about the same size.” We are looking for these areas of what we think are relevant personalization. But if they come and say, “We haven’t done a lot of work in this software industry but we do serve a lot of companies that are between 50 and 100 employees.” Okay, that’s relevant. The reason I bring this up is that so many, all of us I think do this because it’s a little bit of a herd mentality but we all look at the logo stripes that are on everybody’s website and then we go and we try to terrified some of our best customers and we put the logos out there. Now, all of us are seeing those logos whether they’re in emails or on websites and saying, “No, that’s not me. I’m not Google, I’m not Facebook. How is this tool or service or product relevant to my business when I’ve got 5 employees or 50 employees or if I’m located in Nashville, Tennessee which is where we’re based versus if I’m in San Francisco or New York, this is pretty different. Someone wrote to me today and said, “I’ve used a few software companies, we’ve worked with companies with 50, 75 employees. Also, we’ve worked with several firms, one in Lexington, one at Atlanta.” I’m like, “That’s great, that’s in my list.” I know some of these people and I’ve seen their businesses before. It resonates with me, I think we found some success with it because people say, “Okay.” They’re not throwing at me like, “We worked with software companies before. They’re all the largest in the world.” Most of us haven’t gone that big yet. It makes sense. For us, we do send out what I will call marketing emails which are gonna be about this is what our service does, some of the value props, the highlight. If our sales team, if they’re sending out “sales emails,” then those are gonna be very short, to the point, plain text, “I’ve got something I’d like to show to you. Here’s a link that you can click, you get all the information you need in and out of your inbox. You can process this email through the preview. If you’ve got preview on your phone, you can basically see the whole email in the preview. I’m not going to use up a lot of your time by filling into the email and thinking you need to respond. If you wanna book a meeting with us, just click the link. You don’t even have to reply, just click the link and it’ll automatically schedule the meeting.” We do that through our software, the meeting scheduling feature. Making it super easy for recipients to action the email, I think is becoming, for me at least, the number one thing that we can do to help our customers schedule time with us and the number one thing I appreciate when I’m receiving an email. I don’t really like the, “Tell me your availability next week and I’ll schedule a meeting.” That sounds like work for me. I have to go look through my calendar and tell you when I’m available, I think I’ll not reply. If you embed your availability in the email, 10 times that works. If you see one that jumps out, you click it and it’s over. The meeting will go on both for our calendars. That’s awesome, that’s respectable of everybody’s time. It says, “I get it, you’re busy. I do have something and you wanna see it. We’ll meet up for 15 minutes next week.” Those types of things. You still wanna build that big email list, finding ways to personalize those that are meaningful, I think, is the most important. I’ll add on the side, I’ve gotten some of the emails that are written by non humans, the AI crafted emails. It’s so far at least quite a bit to be desired. It’ll see that I’m in Nashville and it’ll say, “Dear Brandon, you’re in Nashville. Have you ever been to the Tennessee theatre? It looks like you have a river running through your city.” I was like, “Who said that?” Would a normal person say that? That’s not hyper personalized, that’s hyper weird. We do try to avoid that to the extent we can. Personalize now, I think, it needs to be more than, “Hi, [first name],” which was state of the art several years ago. You trust a person by name, that’s awesome, it was to them. Now it needs to be more about how do we connect on some level. I don’t think it needs to be on every variable but pick one or two or three variables that you can say, we know they’re in this industry and we have something to say about that, we have something smart that we can say about that and have that be your whole email. Don’t try to go overboard. Marylou: I think the other thing that you mentioned that is becoming more the norm is the small batch approach which believe it or not, back in 2011 when Predictable Revenue was released, it was the small batch approach. We were looking at 25 to maybe emails a day which included second and third iteration. If we’re working on a sequence, the second and third touches were included in that 25 to 50 emails. We were using data, leveraging the data to personalize to the point where we thought we were collecting relevant information and enriching our database. Very seldom did we stop the sequence to edit the email to type in whatever personalization pieces we wanted. We did that with our dream accounts but everybody else, we leveraged the opportunity to be able to collect in the database what we thought were the relevant talking points and then using technology to populate the email for us. I still work that way today. I told my students, I said, “If you think you’re getting a personalized or hyper personalized email from Marylou Tyler for this class, think again. They laughed. Because I’m leveraging the database to have a conversation for relevant topics. When I hear them talk about a pain point, I put that pain point in the database and then I have a sequence that activates or a playlist, whatever you wanna call it, that activates based on that pain point, based on whether what type of company they are, for example. There are ways to do this that still reach out to more people in respectful way and authentic way and hit the right conversation track without having to stop the sequence and type something in and then send it on its way which is where I think people need to go. Those technologies, I think, are pretty cool. It makes opening an email interesting. You know you have the same recipient, open the email multiple times but it changes every time. That’s a fun experience where it’s like, “It’s different now because I boarded the plane and I opened the same email in Chicago and now the message is different. That’s trippy.” It adds this whole level of, “Wow, what’s going on here?” It can weird some people out but it can also be a topic of conversation and becomes an engagement. Marylou: Brandon, people are listening to this thing. I wanna know more about this Brandon guy. How do we get a hold of you? What’s the best way? Brandon: I’m easy to reach. Our website is cirrusinsight.com. My email is brandon@cirrusinsight.com. I’m on LinkedIn everyday, hit me with messages there. If you ever find yourself traveling to or from or through Nashville, Tennessee, definitely look us up. We’ll have you over for a company lunch or put you in the right direction and take a tour to Great Smoky Mountains National Park or go catch a football game or get some great barbeque. Marylou: Thank you so much. I’ll be sure to put all your contact information the notes page. We have the page dedicated to you, Brandon. I’ll put all these relevant links there for everybody. Thank you so much for your time. Great success in your company, it sounds like a fun time for you. Brandon: Thank you so much. Thanks for having me. I look forward to keeping in touch. To anybody who reaches out, we will definitely connect with that $5 Amazon gift code, we’ll make sure to keep that running for as long as possible. Anyone listening to the show weeks or months from now gets a fair shot at it.